Prof. Dr. Dirk Messner is the director of the Institute for Environment and Human Security of United Nations University (UNU-EHS). He is also the Co-Director of the “Käte Hamburger Kolleg / Centre for Global Cooperation Research” at the University of Duisburg-Essen. 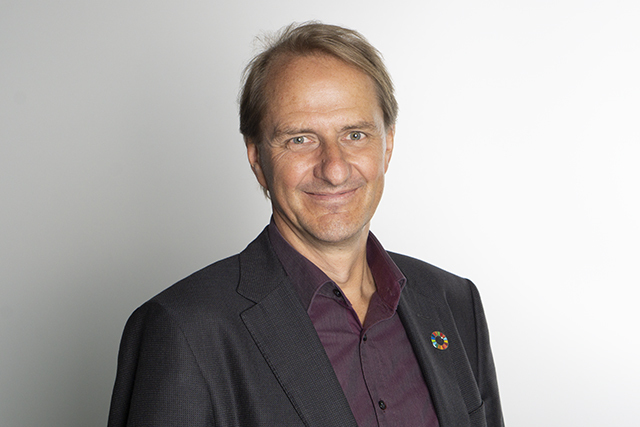 Prof. Messner took over the leadership of UNU-EHS on 1 October 2018. His vision is to further grow the existing research pillars of the institute which are focused on the impacts of global environmental change on human well-being and human security and on strategies of sustainable urbanization, pathways to build resilient societies and environmentally driven migration, while also adding a new research stream on transformations towards sustainability in the digital age. He is an internationally recognized expert on the topics of global change, digitalization, and sustainable development, transformation towards the decarbonization of the global economy, global governance and evolution of human cooperation. Throughout his professional life, Prof. Messner has combined his research interests with teaching activities and he currently serves as a professor of political science at the University of Duisburg-Essen. Moreover Prof. Messner has been chairing or coordinating different international research initiatives. Currently he is one of the coordinators of “The World in 2050”, a global research consortium on the implementation of the 2030 Agenda. Prof. Messner is a member of a number of high-ranking policy advisory councils and his engagements include co-chairing the “German Advisory Council on Global Change”, the “Sustainable Development Solutions Network Germany” and the “Science Platform Sustainability 2030”. He previously also served as a member of the “Global Knowledge Council of the Worldbank” and the “China Council on Global Cooperation on Development and Environment”. Prior to joining UNU-EHS, Prof. Messner led the “German Development Institute” since 2003. Under his leadership the institute developed an excellent reputation for its scientific and policy-relevant research on global sustainable development. Prof. Messner holds a Doctor of Political Science (Dr. rer. pol.) degree and Habilitation qualification from the Free University of Berlin. He is the author or co-author of more than 300 publications. Examples of his recent work are “G20 and global governance” (Oxford University Press, 2018) and “The evolution of human cooperation – lessons learned for the future of global governance” (Routledge, 2016). Prof. Messner also served as the Academic Director of the University of Duisburg-Essen’s Institute for Development and Peace from 1995 to 2002, a Private Lecturer with the Faculty for Political Science at the University of Duisburg-Essen and the Free University of Berlin from 1995 to 2003, and Professor of Political Science at the University of Munich in 2003. A native of Germany, Prof. Messner is also fluent in English and Spanish. Browse through a complete list of his publications here.